Would you like to get more retweets, likes and clicks on Twitter? Do you want to use some powerful statistics to improve your Twitter presence? You can get big results on any network by implementing techniques that work for others. These people have taken the risk and tried out things and made mistakes before figuring out what works. Using these techniques will save you a lot of time and get you quick results. So how do you find these secret techniques? By reading the latest social media data available. Companies regularly extract and analyse data from social networks to find out what works. They even share their results publicly for free. Implementing these techniques will bring you great results as they have worked for a lot of people. 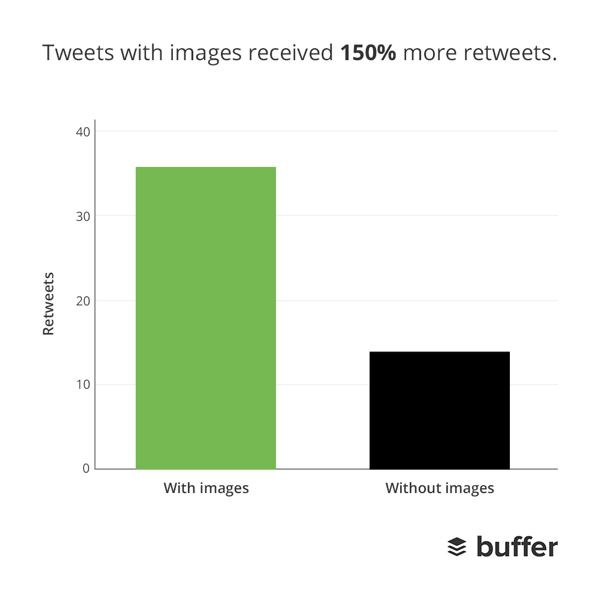 Buffer conducted a study and found that tweets with images get more retweets, likes and clicks than those without images. This is because tweets with images stand out from the plain ones. 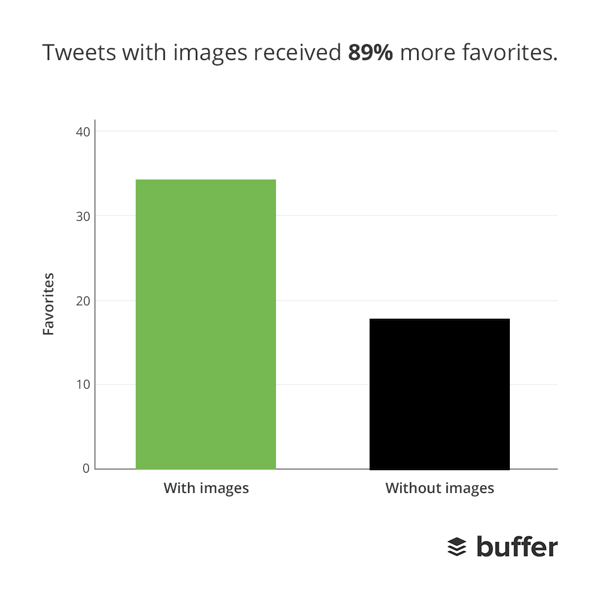 So you should begin accompanying your tweets with images whenever you can. 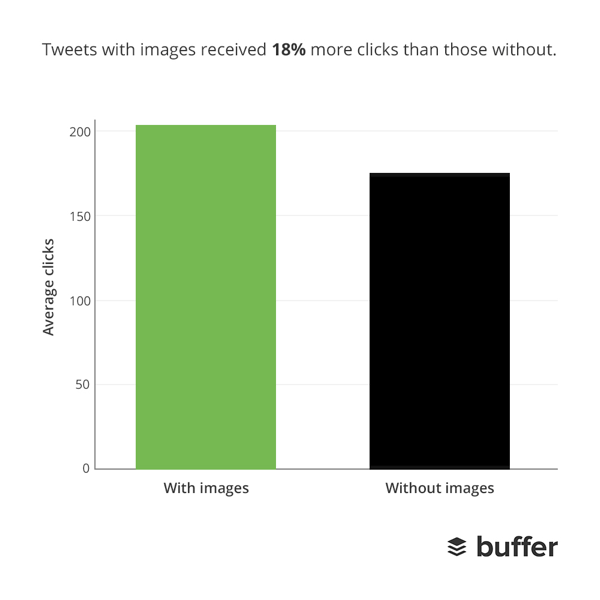 The type of image you include should depend upon your goal. If you want more engagement, i.e. retweets and likes, you will need to share images that don't lead people elsewhere. These could be things like image quotes. People will see all the information they need to see on the image itself. An example is the above tweet from Tim Fargo. It is a simple tweet with an a little text, a hashtag and an image. There are no distractions like links. This is one of the reasons why it got a good number of retweets. If you want more clicks you will need to share a link and an image that shows people what the link leads to. For example if you were sharing the link to the blog post, you can include an image that has a curiosity generating headline that will get people to click on the link like in the above tweet. Dan Zarrella found that tweets that used Bit.ly URL shortener got 9.28% more retweets. This shows that people find the Bit.ly URL more credible. Hootsuite’s Ow.ly came second but its retweetability is less than 1%. You can easily make sure that all the tweets you share have their links shortened with Bit.ly by using Buffer. By default Buffer will shorten the URLs using buff.ly, but you have the option to change this to Bit.ly. If you have a Bit.ly account you can even connect that to your Buffer account and track clicks on your URLs on Bit.ly itself. 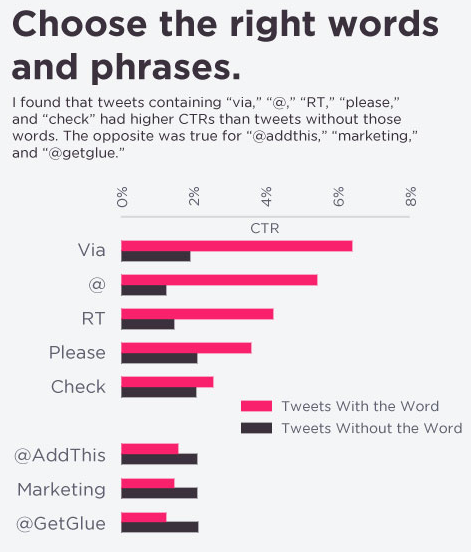 Dan Zarrella also found that tweets that contain ‘via’ and ‘@’ tend to get more clicks than tweets that do not have these words. This is because when you use these two words/characters, it usually indicates that you are sharing content by another author or blog (you use ‘@’ in the tag). People expect this to be really good as you’re sharing content that isn’t your own. 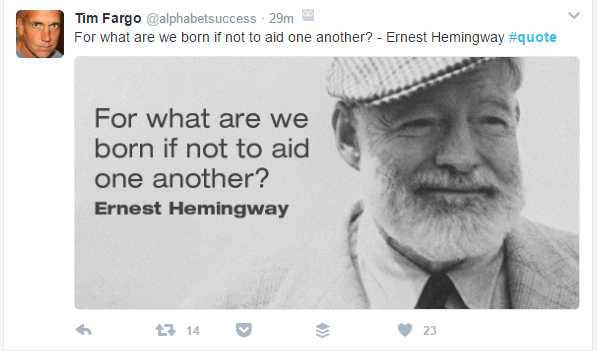 This is why whenever you share content created by others you should tag them in the tweet and add the words ‘via’. This will not only help you get clicks and build a strong relationship with your followers, but will also help solidify the relationship with the person you mention. You can add a couple of words to even compliment the person you mention. The relationships you build will also help drive traffic, when you share links from your own blog. Even the people you mention in your tweets will return the favour by sharing your content and mentioning you. Note: For this technique to work, you will need to consistently tweet links to quality content only. If you tweet bad content people will consider you a spammer and stop clicking on the links in your tweets and even unfollow you. So read each and every piece of content thoroughly before tweeting or retweeting it. They should be on topics your audience wants to read. 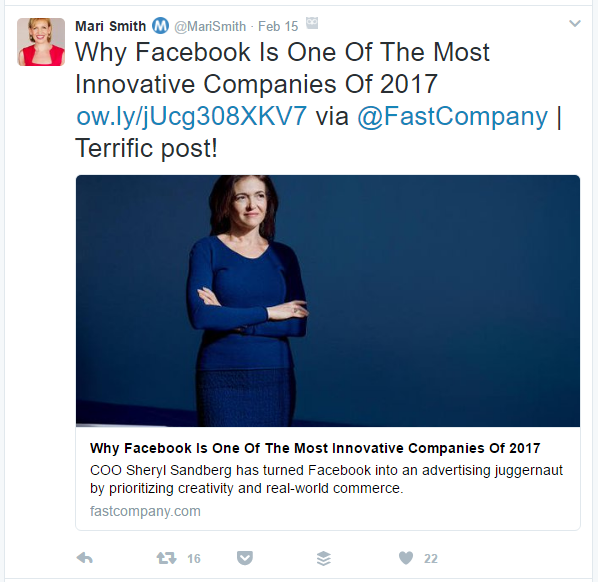 Mari Smith regularly mentions people and compliments the content the link leads to in her tweets. For example when you look at the above tweet she uses both ‘via’ and ‘@’ as she tags Fast Company because she shared the article from their website. She also included the compliment ‘Terrific Post!’. This will not only get her links more clicks, but will help mold a relationship with the site. If you go through her feed you will notice that she regularly does this and she only shares high quality posts. 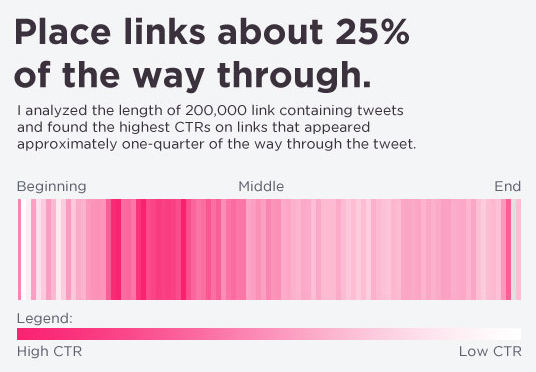 Dan Zarrella even found that tweets in links get the most clicks when you place them 25% of the way through a tweet. Therefore, it would be a nice idea to add the link to the content you share early on in the tweet instead of right at the end. The half life of a post on any social network is the amount of time it takes the post to get 50% of its engagement. For Facebook this is 90 minutes and for Pinterest it is 3.5 months. This is why on these networks it is okay when you publish only a few times in a day. But on Twitter the half life is 24 minutes. This means that it will only take your tweet only 24 minutes to get half its engagement. Within an hour it will get most of its engagement and after that it will only be a tiny trickle. Therefore, it is okay for you to tweet every 30 to 60 minutes on Twitter. You won’t be angering your followers as long as it is quality content. People only get upset and unfollow you when the articles aren’t up to the quality like I mentioned earlier. 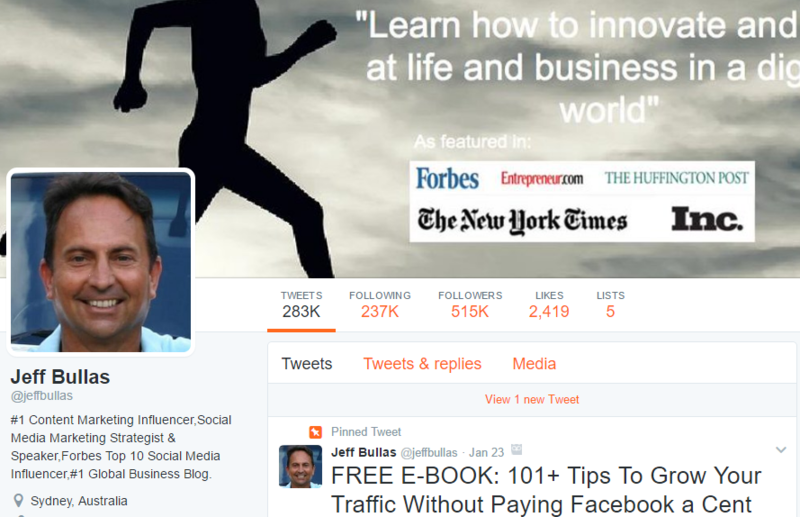 If you visit Jeff Bullas’ Twitter account you will notice that he tweets several times a day. He usually tweets more than 1 tweet an hour. But his follower count hasn’t slowed down. He has built a massive following of more than 500,000 and it continues to grow at a quick pace. This is because he only shares quality blog posts. People nowadays follow a lot of people and use several social networks, hence they won’t always see your updates. Sharing several times won’t anger them. 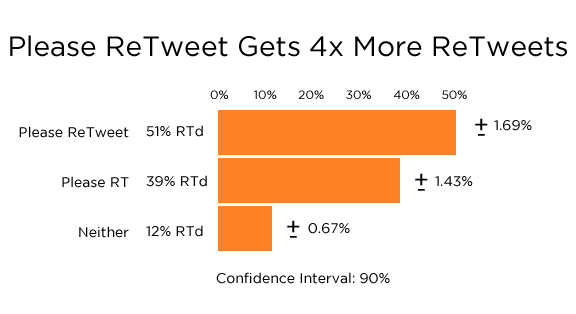 Another study found that when you ask for retweets you get more retweets. When you use the word ‘Please RT’ in your tweet you get 39% more retweets and you get 51% more retweets when you use the whole word ‘Please Retweet’. Therefore, if you want more retweets you should use the word ‘Please Retweet’. If you don’t have sufficient characters left you can use ‘Please RT’ instead. You don’t have to use them each and every time, just use them for your most important tweets. These are the statistics that can improve your twitter presence. They will help you get more retweets, favourites/likes and clicks. Experiment with them to see which ones get you the best results. 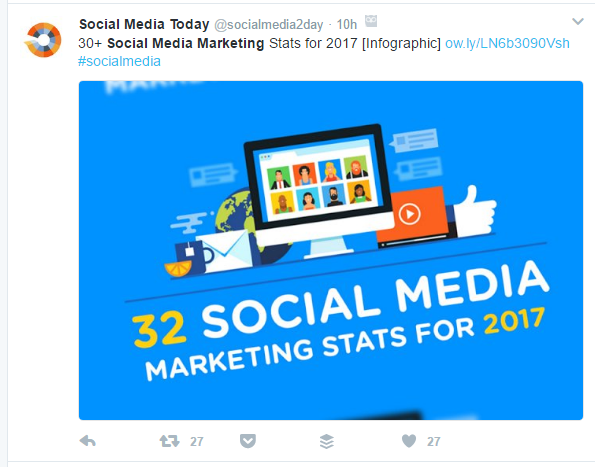 Which Twitter statistics do you use to improve your engagement and traffic? Have you used any of the above techniques before? Please leave your comments below. Digital marketing consultant and the owner of the marketing consultancy Kurve. Follow him on Twitter @Orengreen.